Last Friday night Stuart and I went to see Three Days In The Country at the Lyttelon Theatre on London's glitzy South Bank. Chekhovian at its melancholic heart the story is one of unrequited love, deep regret and doomed bittersweet dalliance. Oh, and it's laugh out loud funny. 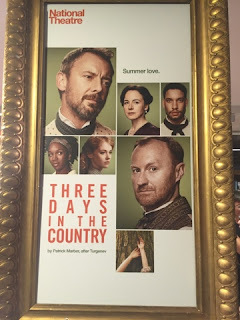 Starring Mark Gatiss and John Simm this freely adapted production is a cut down version of Ivan Turgenev's 1850 comic play A Month In The Country but with more jokes and snappier action. Patrick Marber's fresh English translation has a very contemporary feel and it was only the odd Russian song that pulled the action back to Ivan Turgenev original isolated Russian setting. Gatiss is a joy as the all too frank doctor and his failed attempts to woe his intended and similarly Simm's sardonic suitor simply smolders. The Doctor Who connection between these two actors is brought into sharp relief when at one point Gatiss's character exclaims to Simm's character, "Good advice... (pause) from THE MASTER."